There is a time and place for everything and writing style is no exception. Conversational writing is fine, in fact it is recommended for blogs, Facebook postings, and letters to friends, even informal inter-office memorandums. But when you are writing academically, professionally or scientifically it is time to use a formal writing style. I feel I am capable of both when necessary.My biggest problem, as you probably have guessed, it being concise. Like Scarlett O’Hara, I do run on, lol. But I feel that has its place too. But in the interest of getting my point across when my words are limited, being concise is becoming more important to me in the arena of social media. Great writers know how to be economical with words. That is, they can squeeze the most meaning out of as few words as possible. For instance, instead of: “There is some evidence that” use: “Evidence shows“. 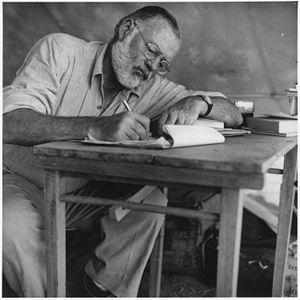 One of my favorite writers, Ernest Hemingway, was once challenged to write an entire story in six words. His answer: “For sale: baby shoes, never used.” Awesome! We immediately know what happened in this “story” and it makes us sad. One more example comes from Guatemalan writer Augusto Monterroso also wrote a very short story called El Dinosauro (The Dinosaur): “Upon waking, the dinosaur was still there.” Anyone have a clue as to the story here? These are all actual stories – they all tell a tale, at least by implication. Your imagination fills in the rest, and isn’t that what great writing is all about?